Sarah in Illinois has made it through her second week of raising chickens. She’s back today to report on what she’s learned and how things are going. See her first post introducing her flock. So far things with the chickens couldn’t be any easier. Each morning I open the coop, make sure they have water and some food. Each night they return to their coop about 7:30, and I close it back up. That’s it. They are not laying eggs yet. They should be old enough in the next couple weeks so I look for eggs every day just in case. I will give you a quick tour. 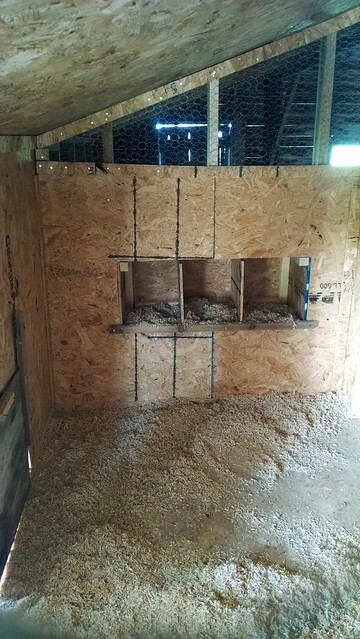 We made a coop inside one of our barns. 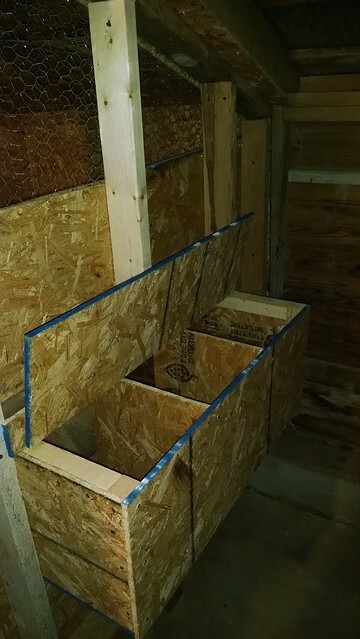 I have access with both a full door and a lid to lift off of the nesting boxes. 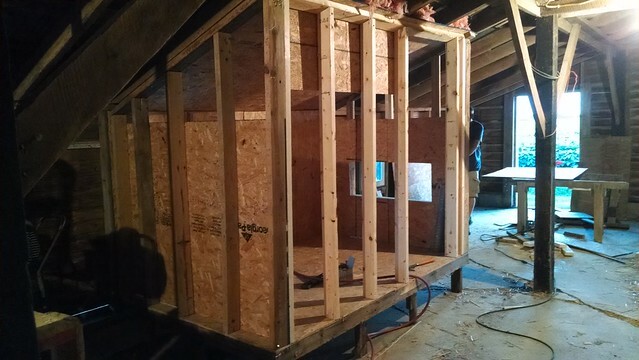 The chickens have a roost with plenty of ventilation. I do plan, however, to add another roost up a little higher. They have access outside to the pen that was for Treu. I knew from the beginning that they would easily be able to fly over the fence, since there is no top to it. I was just hoping that with all the room and shelter under the trees that they would just prefer to stay inside. Have you ever seen chickens laugh at you? I am pretty sure I have. Here they are very clearly not inside the pen! And the funny thing is, once they get out they don’t always remember how to get back in. I mentioned in my last post that Toothless may be an issue. And she has been. I don’t think she has any intentions of hurting the chickens. She just thinks of them as her own personal toys. She loves to run right up into them when they are huddled together and just watch them go flapping and squawking away. 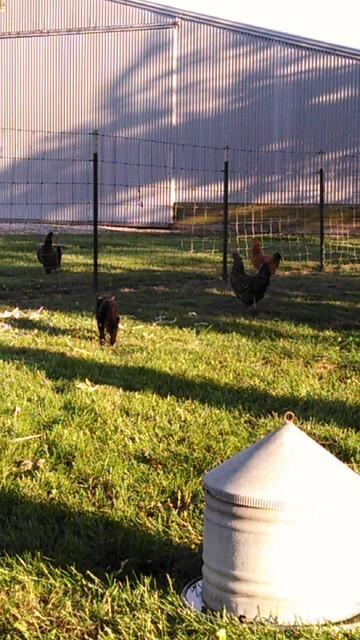 Here she is sneaking up on them, you can see one of the chickens has hopped the fence to get away from her. It was funny the first time, but it is not something I want to encourage and I can tell the chickens are nervous when she comes around. One night I went to close the coop, and I only counted 3 chickens. I quickly ran outside to see where the fourth one could be. Toothless had her cornered in the bean field. I knew at that point I had to do something quickly. I now have a squirt bottle of plain water that I keep out at the pen. Any time I see Toothless lurking around I give her a quick squirt of water and she goes running. Obviously I can’t sit out there all day and keep watch so I am hoping she gets the hint quickly. Otherwise, I am just enjoying them. 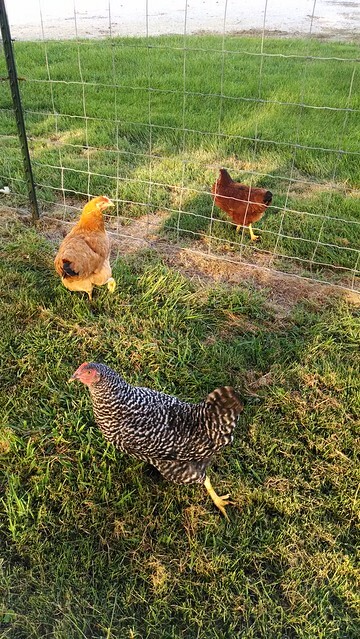 I go out to their pen every day after work and watch them peck the ground. I have given them tomatoes and cucumbers from the garden and I love to watch them chase each other and play keep-away. So far they haven’t found our garden. They can’t see it from the pen. I am hoping it stays that way. I don’t want them to have their own private buffet. But as I mentioned above, have you ever seen a chicken laugh at you? Anyone else new to raising chickens? Have any advice on getting Toothless to behave? Any predictions on when I will get my first egg? It sounds like your girls are doing well, Sarah. With our chickens and ducks when I was growing up, my Dad put a mesh roof on our run. 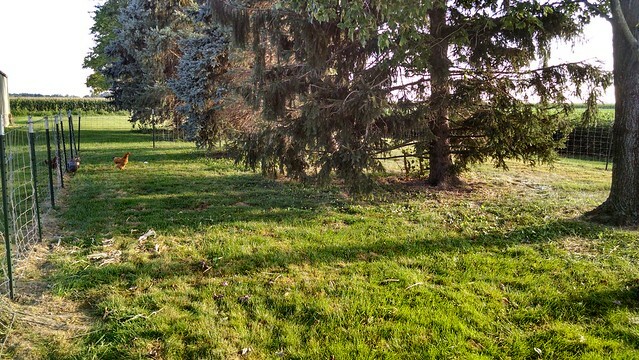 Treu’s run looks pretty big, but a covering of some kind would help keep the chickens in and Toothless out. 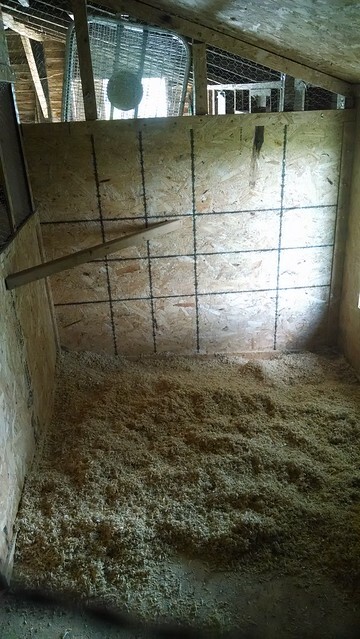 We also put straw in the nesting boxes, even when we had shavings in the coop itself. I’m not sure if that makes a difference for encouraging them to lay or not. They look happy as can be! You’ve got a nice environment for them to live in. A spray bottle is a good idea. Hopefully Toothless will get the idea before he manages to traumatize them. I can see why they would be attractive to him, though! I think Toothless is getting the hint, when she sees me pick up the spray bottle she runs away. 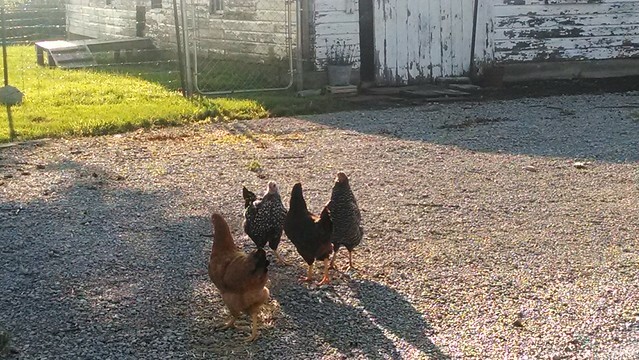 But I did find the chickens in the front driveway the other night, that is about 50-60 yards away from the pen on the opposite side of our house! So she had to have scared them and run them around front. It is an ongoing job for me right now! Julia, I will add some straw to the nesting boxes, I have read of people doing it both ways. I may just give them an option and see what they prefer. 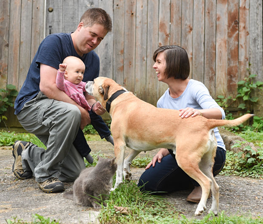 As for the pen, I don’t want to get too excited or get my hopes up too much, but there is a possibility of needing part of that pen back for a puppy sometime this fall :D, so I am not going to make any changes until I see how that all pans out. Most days they do stay in their pen just fine.